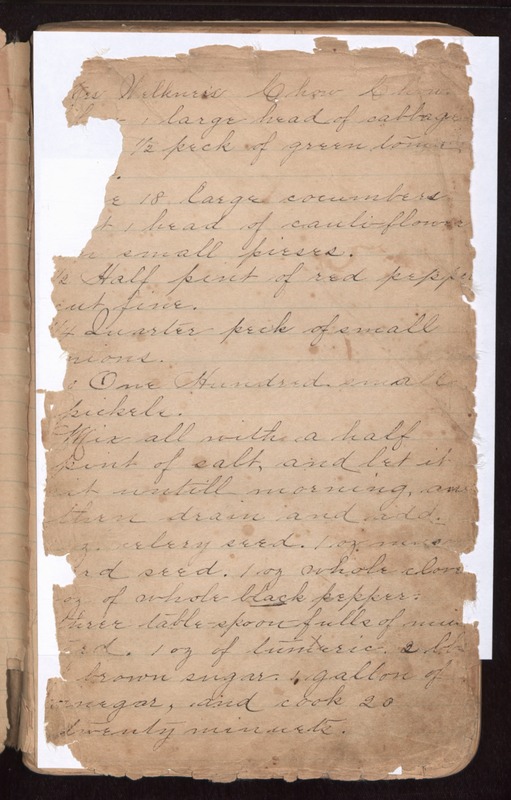 Mrs Welkner's Chow Chow [illegible] 1large head of cabbage 1/2 peck of green toma 18 large cucumbers 1 head of cauliflower small pieces 1/2 Half pint of red pepper cut fine 1/4 Quarter peck of small [(o)nions] One Hundred small pickels. Mix all with a half pint of salt, and let it sit untill morning, and then drain and add celery seed. 1 oz mustard seed 1 oz whole cloves oz of whole black peppers three table-spoon-fulls of [mu(st)]ard 1 oz of tumeric 2 lbs of brown sugar 1 gallon of vinegar, and cook 20 twenty minuets.